GED®/Skills Review classes at UCC North County! Classes are located at the North Douglas High School in the evenings and on Saturdays. Contact the UCC Woolley Center at 541-440-4603 for more information and registration. Adult Basic Skills (ABS) is a non-credit program. The UCC basic skills program prepares adult students to be college and career ready, to the 12th grade/high school graduation level. Instruction is offered in reading, writing, mathematics, science, social studies, critical thinking, and job skills preparation via our GED®, Skills Review, and English Language Acquisition/English as a Second Language (ELA) programs. Any persons sixteen years or older currently performing below the high school graduation level, regardless if already have a high school diploma or GED®, is eligible to apply. New and returning Adult Basic Skills students should contact the Woolley Center location to schedule an orientation. ABSD Chair lets student success happen in its own time. 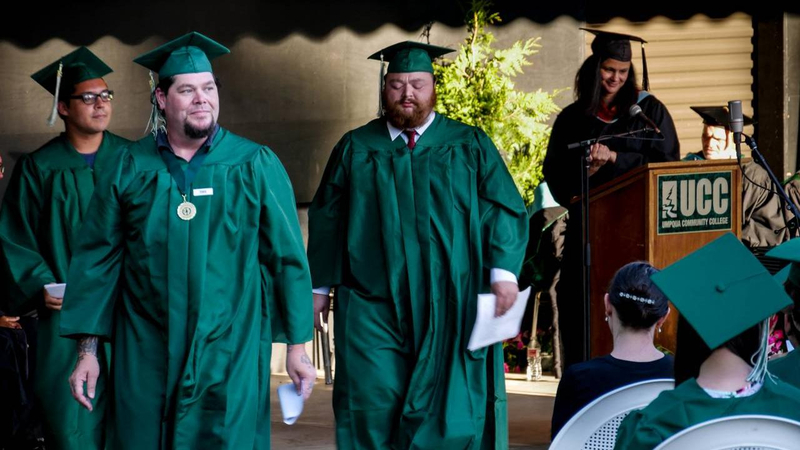 Adult learner steps back in to education, completes a GED, and sets new goals. El Centro de Educación para adultos en UCC ofrecen cursos básicos (en inglés) en las areas de lectura, escritura, matemáticas, ciencias, ciencias sociales, preparación para tomar el examen de GED®, y el mejoramiento de destrezas en varias áreas. El Centro de Educación para adultos en UCC ofrecen también inglés como segunda lengua (ELA). Los estudiantes pueden matricularse al comunicarse con la oficina del Woolley Center.